I made this chicken sandwich a couple weeks ago with a big red steakhouse tomato and it was fantastic. 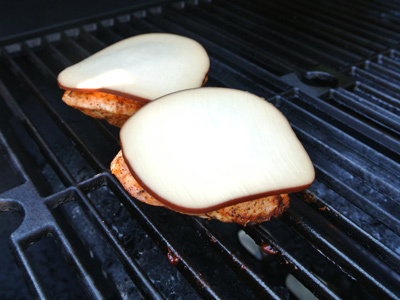 The flavors of grilled blackened chicken with smoked gouda cheese and chipotle mayo made it special. Joe and I loved it so much I promised to make it again soon. I went to the farmers market to pick up a tomato for the sandwich but changed my mind when I saw these big ole green tomatoes sitting out on display. Why not try something different . 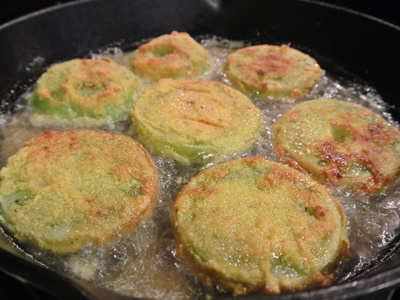 . . so I changed it up a bit by adding a fried green tomato slice for a tangy twist. For those who love fried green tomatoes, this sandwich will not disappoint, but if you are a traditionalist, by all means go with a big slice of summer red. You can’t go wrong either way. And if you can stand the heat of the oven, roast some potato wedges with a drizzle of olive oil, salt and your favorite herbs. It makes the best side kick to any sandwich! I always keep some chipotle mayo on hand. It’s good on so many sandwiches. Here’s how I make it . 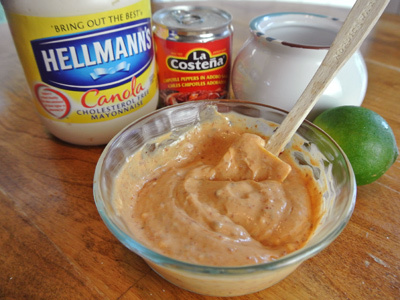 . . 1/2 cup of mayo with 1 tablespoon of chipotles en adobo, 2 teaspoons lime juice and a pinch of salt. Mix it together and refrigerate. You’ll need some blackening seasoning. I love Chef Paul Prudhomme’s blackening seasoning but I have a recipe to make your own which I will share. 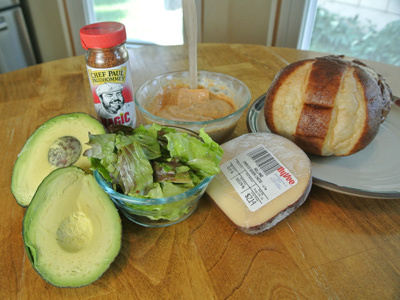 Also some smoked gouda cheese, lettuce, avocado slices and a good bun. 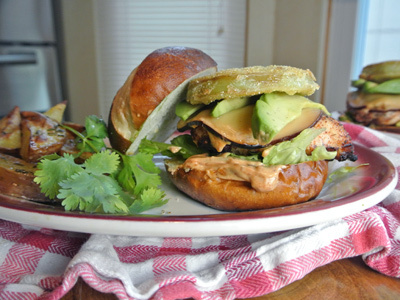 If you can find the pretzel buns they are really good for chicken sandwiches. If you want to go green, you’ll want a thick slice per sandwich. 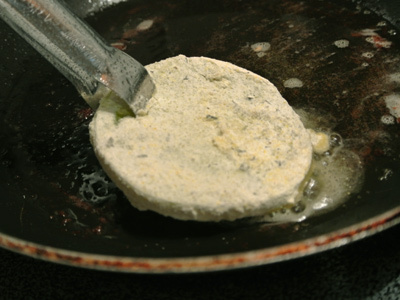 Sprinkle with FGT seasoning and dredge in cornmeal/flour mix then pan fry for a couple minutes on either side. These are ready, place them on a plate lined with a paper towel. I kept them warm in the oven until time to top my sandwich. 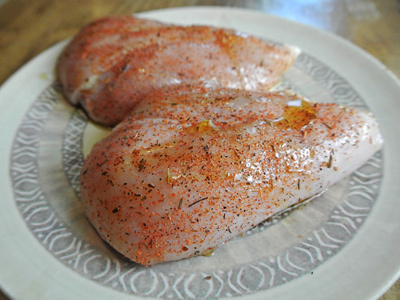 You can go with either chicken breasts or thighs. 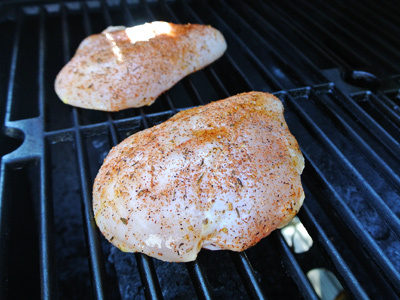 This time I’m grilling up chicken breasts, sprinkle with blackening seasoning and drizzle with olive oil. Set your chicken on a hot grill. It should go about 10 – 15 minutes depending on how hot your grill. After 15 minutes, turn it over to go another 15 minutes. I also checked the internal temp which should read about 170 for poultry. When it’s almost done, add a slice of smoked gouda cheese to melt. 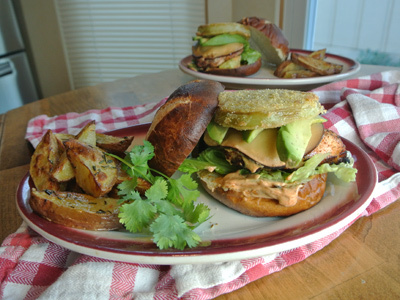 Assemble your blackened chicken on a pretzel bun slathered with chipotle mayo, a layer of lettuce, grilled chicken with melted cheese, sliced avocado and a thick slice of fried green tomato. Try to get your mouth around all that!! 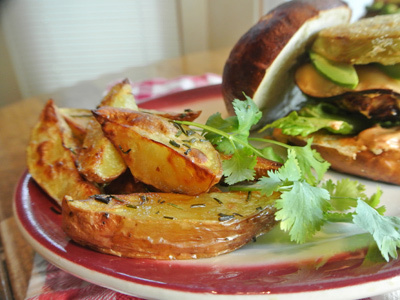 Some roasted herbed potato wedges on the side, anyone? Heat a gas or charcoal grill. Season chicken pieces with blackening seasoning and drizzle with olive oil. 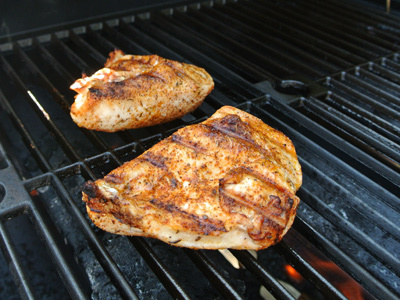 Grill for 15 minutes, turn and grill an additional 10 – 15 minutes. Internal temperature should be 170 degrees for poultry. Place a slice of smoked gouda on each chicken piece and melt, approx 5 minutes. Combine Cornmeal and Flour together in a ziplock bag. To make FGT, heat a skillet over medium high heat with enough canola oil to coat the bottom. 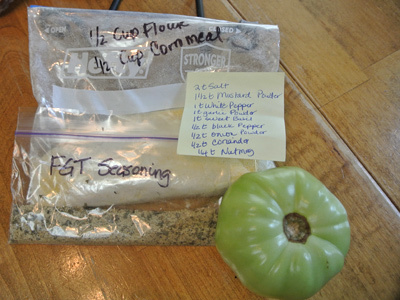 Sprinkle FGT seasoning on each tomato slice and dredge in cornmeal/flour mixture. Fry approximately 2 minutes on each side or until the tomato slices fry crisp and brown. Drain on a plate lined with paper towels. Keep warm in oven on warm setting until ready to top sandwich. Assemble sandwich on pretzel bun with chipotle mayo, lettuce, grilled chicken and melted cheese. 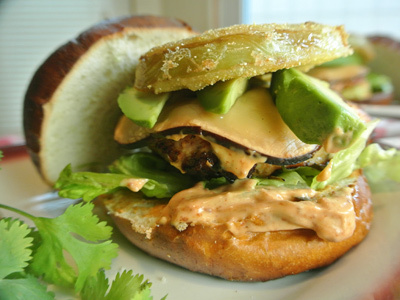 Top with avocado slices and a thick slice of fried green tomato. Mix ingredients together. Refrigerate any unused portion in airtight container. Preheat oven to 425 degrees. Wash and dry the potatoes, slice into wedges. Place wedges in a microwave container, drizzle with olive oil, cover and microwave on high 2 minutes. Toss potatoes and microwave another 2 minutes. Spray a baking sheet with cooking spray and lay potato wedges single file. Drizzle with olive oil, sprinkle with salt and cut herbs. Bake for 15 minutes, turn potatoes and bake an additional 10 – 15 minutes or until they are golden brown and crisp on the outside.